Australia’s incendiary extreme musical export, THY ART IS MURDER, have revealed the original uncensored cover artwork for their upcoming release, Holy War. “We wanted Holy War to be our most confronting release to date,” explains guitarist Andy Marsh. “From the moment the album title was conceived and the lyrics were born we had a distinct vision that the album cover artwork must be equally as confronting, as scary, and as real as what we are about as a band. Unfortunately after circulating our intended album cover around to the distributors and retailers, and after several meetings with the label and those we all work with, we were told we would have to cover the image, or choose a different cover. Not wanting to alter our desired cover in any way shape or form, we opted to contain it within the album packaging and roll with one of the other images from the layout. The album cover and packaging photos were shot by the band’s long time photographer and friend, Thomas Savage. 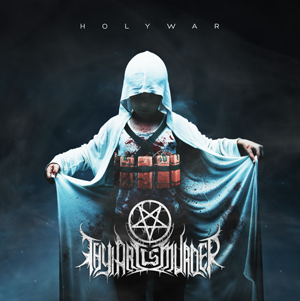 Produced and mixed by Will Putney (SUICIDE SILENCE, EXHUMED, THE ACACIA STRAIN), Holy War is the band’s second release for Nuclear Blast Entertainment. It will be made available in various formats (digital; limited digi-pak + bonus track; assorted color vinyl; exclusive mail-order picture disc) and unleashed in North America on June 30th, in Europe & Australia on June 26th, and in the U.K. on June 29th. Catch the band on tour with SLAYER, KING DIAMOND and WHITECHAPEL as part of the Rockstar Energy Drink Mayhem Festival!